No child should wake up or go to bed hungry. Hunger is not only detrimental to a child’s physical health, but also harmful to a child’s learning. That is why, as part of our mission to help children and families build healthier lives, Lutheran Services Florida (LSF) is a sponsor for the USDA Child Care Food Program (CCFP) for licensed family child care homes. 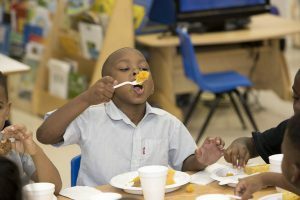 The goal of the Child Care Food Program is to ensure that children under 13 years of age in day care and/or after school programs receive healthy, well-balanced food every day, thereby improving their diets and helping them build good eating habits. The welfare of children has always been a priority for LSF. In 1987, we started our Child Care Food Program to help children receive nutritious daily meals. The program also provides families with referrals to affordable home day care facilities where children are served well-balanced food throughout the day. Beginning with only 40 day care homes, today the Child Care Food Program has grown more than tenfold to include almost 450 providers. Since LSF began the program, some 25,000 children have benefited. More than 50,000 meals and snacks are served every week to children in day care facilities affiliated with the LSF Child Care Food Program. 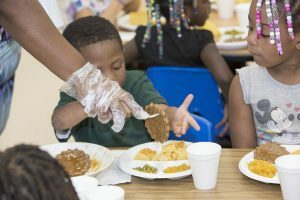 Because many children come from low-income families with both parents working full-time jobs, often the most nutritious food they will eat all day is what they are served in their day care facilities. Through this program, LSF assists licensed family child care home providers with developing a variety of nutritious meals and menus, provides USDA reimbursements to eligible providers, delivers training and technical assistance, and monitors for quality assurance and compliance issues. We encourage Providers to visit the KidKare support page at http://help.kidkare.com to learn how to get started, sign-up for a live webinar, view instructional videos, and find answers to frequently asked questions.